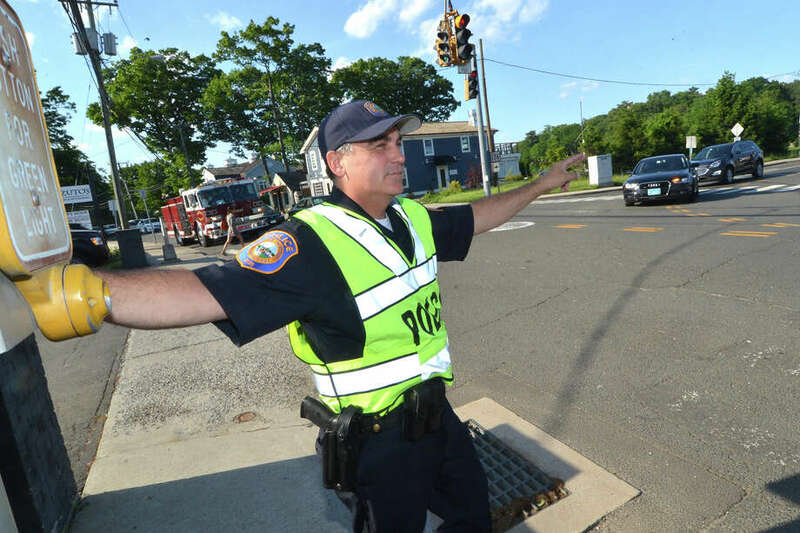 Westport Police Detective Phil Restieri motions to drivers to make the right turn on red onto Bridge st over the Saugatuck River bridge during rush hour traffic on Tuesday May 31 in Westport Conn.
WESTPORT—The state Department of Transportation recommends either "major rehabilitation" or "structure replacement" for the 132-year-old Saugatuck Swing Bridge, according to the DOT Rehabilitation Study Report released Friday. Replacing the bridge would cost $35.8 million while the estimated repair cost, which includes the installation of a temporary bridge during rehabilitation, is $19.8 million. The two options were analyzed for how much they would cost over a 75 year span. Life cycle cost over that span would be $41.43 million for a replacement bridge and $41.27 million for renovating the bridge. Members of the　Westport Preservation Alliance, spearheaded by preservationist　Morley Boyd, have been working to designate the bridge itself, and areas abutting the bridge along both banks of the Saugatuck River, as a local historic district. The bridge — the oldest moveable span in the state — is already listed on the　National Register of Historic Places. The report zeros in on the truss system which the DOT says is in "critical condition" and the trusses are "fracture critical by design; and as such, failure to a primary truss member, if not properly maintained, could risk truss collapse and pose a safety hazard to vehicles and pedestrians. The trusses have sustained severe and consistent vehicular impact damage throughout the entire structure. The wind load capacities for the truss are also substandard." The report states that the "load capacity of the bridge is substandard," and mentions the steel diagonal cross-bracing members at Pier 2 as having "heavy rust and up to 100 percent section loss and are rated as critical. Five of the six piles have loose or missing fiberglass jackets, and the exposed concrete is scaled and exhibits exposed reinforcement." The deck geometry of the bridge is rated a "2" which the DOT says is "basically intolerable requiring high priority of replacement." The DOT says the width of the roadway over the bridge is "substandard" and "is contributing to the high frequency of accidents that occur on the bridge structure." They cite 16 accidents on and near the bridge from 2010-2014, specifically "69 percent of the recorded accidents are sideswipes." The DOT classifies the guiderail system running along the bridge as "substandard" and "not crash test compliant." "The existing substandard railing, narrow roadway width, and the proximity of the truss system to the edge of the roadway are all contributing to the extensive vehicular impact damage to the truss members," the DOT said. The DOT maintains that the mechanical and electrical system is in good condition, but prone to flooding damage. What action will be taken by the DOT? Off the bat, the DOT ruled out no action being taken due to public safety concerns. The DOT also dismissed the minor repairs action plan, which would repair the truss system, Pier 2 and other small repairs, because it "does not incorporate preventative measures to preclude further truss vehicular damage and does not address the substandard load capacity of Pier 2 based upon today’s standards." The DOT also eliminated the one-way bridge access choice which would repair the truss system, Pier 2 and replace the bridge railing. Replacing the bridge railing would limit the bridge to a one lane road and because of its adverse impact on traffic, was not considered possible. The only two actions that the DOT recommended were major rehabilitation and replacement of the bridge. Major rehabilitation would consist of: repair, painting and widening of the ornamental trusses, a new bridge railing system, a new support system for Pier 2, increasing the height of the bridge to 14’-3," adding a moment connection to the trusses, deck patching, waterproofing and paving, painting of the steel, steel repairs, patching of the substructure and a roadway barrier at both approaches. This project, if chosen, would close the bridge to traffic for up to three years and the installation of a temporary bridge to carry traffic along Route 136. The total project would cost an estimated $19.8 million. The replacement bridge would have a four span structure with two multi-grinder fixed spans and a two span Pratt Truss swing span—costing an estimated $35.8 million. A cost evaluation over a 75 year period said the life cycle cost of major rehabilitation would be $41.27 million compared to $41.43 million for replacing the bridge. A complete bridge replacement was also investigated as a base line cost comparison for the Major Rehabilitation alternate, which also involved a life cycle cost analysis. A conceptual replacement bridge option would consist of a new four span structure with two multi-girder fixed spans and a two span Pratt Truss swing span. The cost for a new structure was estimated to be $35.8 million. A lifecycle cost analysis was performed to estimate the overall cost of each alternative over a span of 75 years and represents costs in today’s dollar amounts. The life cycle cost is $41.27 million for Major Rehabilitation and $41.43 million for a Structure Replacement. First Selectman Jim Marpe said the reprocussions of additional height on the bridge would add to traffic congestion. "I am pleased that the DOT has listened to the Westport community and is going back to the drawing board to do further study and more public outreach before deciding the bridge's future," Selectwoman Helen Garten said. "But we should be concerned about both　options that the DOT has put on the table.Both　would　increase the bridge's height,　opening the　bridge to large　tractor trailers, which is　of great concern to our community," she added. John Suggs, RTM District 5, considered the report a "victory" and called the news "Christmas in June." "The Town has been heard. Fix it but don't replace it. Though we still have our work cut out for us. Specifically making sure that the top isn't raised to allow big trucks across the bridge," Suggs said. There will be a public hearing at the Westport Town Hall auditorium on June 15 at 7 p.m. for residents to comment and gather more information from the DOT.